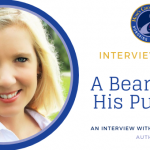 Interview with Miranda Mittleman, Author of PAWS and THINK! 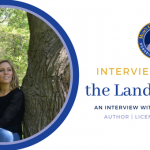 Continuing with our interview series, we had the good fortune of speaking with author Miranda Mittleman, who is a three-time Mom’s Choice Award-Winning writer for her PAWS and THINK!® series. Not only that, but Miranda still finds time to write poetry, run, and spend time with her awesome husband, Michael, two-year-old son, Hunter, and their adorable dog Weaver. MCA: Hi Miranda! Thanks for joining us again. We are thrilled to be keeping up with Weaver’s adventures. Tell us about the new book. What do you hope your readers will walk away with after they finish Be Thankful For What You Have? Miranda: Each book in the PAWS and THINK!® series teaches a valuable life lesson and Be Thankful For What You Have is no exception. In this new book, Weaver meets a puppy who is waiting to be adopted. He comforts him and says “I met a great family and so will you!” This quick encounter causes Weaver to “PAWS and THINK” about how thankful he is for his home and family. My hope is that children can relate to Weaver and realize how appreciative they should be for what they have. Even as adults, we sometimes forget what is truly important in life and Be Thank For What You Have is a perfect reminder. MCA: We love that. What an important lifelong lesson. Speaking of lifelong, what makes PAWS and THINK! great for all ages, even for infants? 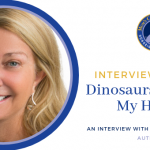 Miranda: When I created PAWS and THINK!®, I had children AND adults in mind. I have found that children find it easy to relate to Weaver, the curious and playful pup, and really enjoy the rhyming too. They are learning pretty deep lessons in a lighthearted manner. The infants and toddlers may not quite understand the important lessons just yet, but they seem to love the bright, colorful illustrations that are an integral part of my series. I am confident they will grow with my books and enjoy Weaver’s adventures. As for the parents and teachers, I believe that many value the fact that “less is more”. I wanted to keep my books short and simple to not only hold the attention of the little ones, but to deliver my messages in a positive yet direct matter. Through my short poems, I’ve been able to tackle lessons on self-importance, gratitude, diversity and friendship, which I feel most adults would consider vital. I have always believed that it is never too early to start reading with your child. When my husband and I had our son, we knew that we not only wanted to make books a part of his nighttime routine, but something that we did every day as a fun activity. PAWS and THINK!® books have become a staple in our household and I hope that families everywhere will enjoy these books with their little ones. MCA: It’s sweet picturing you reading the books you’ve written to your son! We also heard about your book launch party. How did it go? Miranda: Our Book Launch Party was huge success! I was humbled to see hundreds of PAWS and THINK!® fans come out to celebrate the release of our third book, Be Thankful For What You Have. Greetings and Readings in Hunt Valley, Maryland were our gracious hosts once again! This year, we had face painters and balloon artists for the kids in addition to our giveaways and raffle prizes. We had so many families attend that we couldn’t quite fit in the children’s section for story time! Instead, I read my new book in the large lounge area before heading to the front of the store for the book signing. 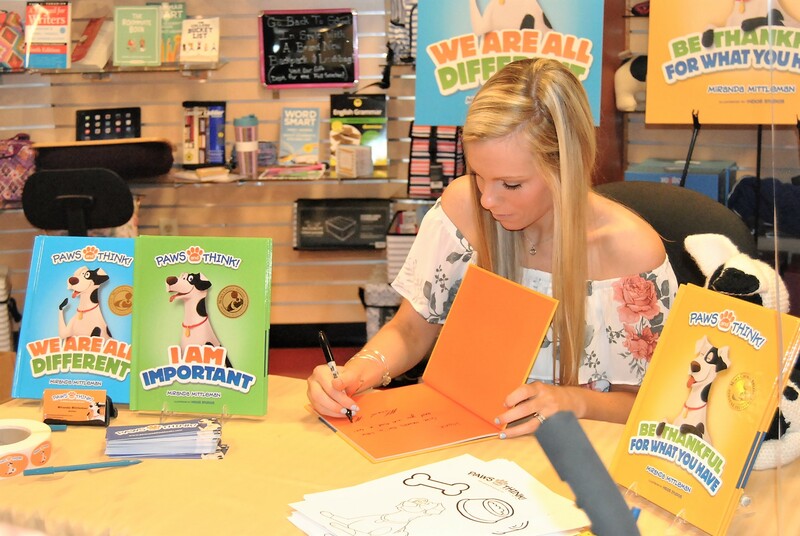 It was amazing to see so many children eager to get their signed copy of my new book to add to their PAWS and THINK!® collection! MCA: Excellent! You’re a busy lady, too, apart from writing wonderful children’s books. Can you tell us about your Charity of the Quarter? 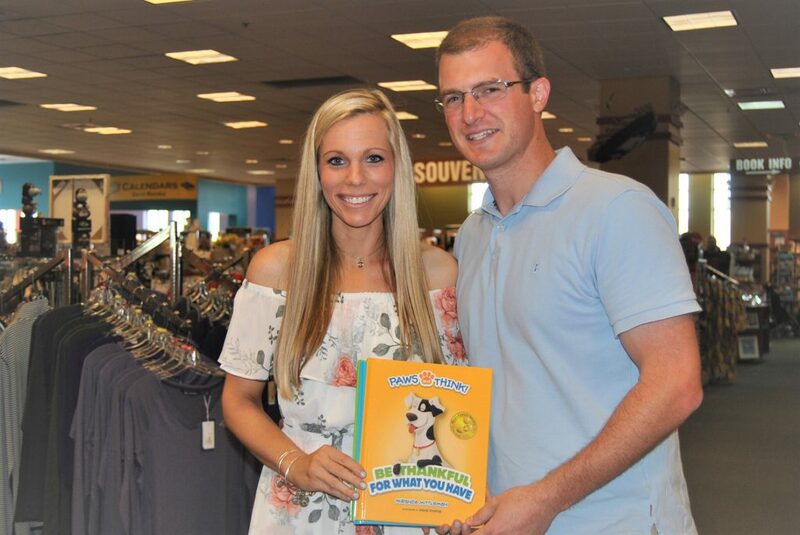 Miranda: I created a Charity of the Quarter program where I donate a portion of the proceeds from every PAWS and THINK!® book sold to a different charity or non-profit organization each quarter. This quarter, we are working with an amazing organization called We Rescue Love, Inc. It is a non-profit, foster-based, no-kill rescue committed to saving homeless dogs. This organization is so dear to our hearts because they rescued our dog, Weaver, who is the inspiration for my books. We are so thankful for what We Rescue Love has given us and are honored to give back to them! Keep an eye out for their logo in our new book, Be Thankful For What You Have! MCA: The last time you visited you also mentioned your school visits. I’m sure those have continued, and even grown and developed over the months and years. Miranda: School visits are my absolute favorite part of this journey so far. In my first year as an author, I’ve had the opportunity to visit over 60 schools and share my books with thousands of children. I never imaged how rewarding it would feel to help teach important lessons and inspire children with something that I created. I always include a Q&A session in my school presentations. I encourage students to ask me anything about my books, my dog (and main character) Weaver, being an author, etc. I always get some interesting questions, some serious ones and some very hilarious ones! I also get stories from students who are eager to share things about their own lives. It truly brings me joy to see children excited to learn and talk to me. In addition to sharing my stories with students, I’ve also enjoyed the wonderful relationships that I’ve developed with teachers, librarians/media specialists, principals and parents. I’m humbled by the excitement and support that I’ve received for my books and I’m anxious to start off the 2018-2019 school year with many more author visits! I’m looking forward to sharing my new book,Be Thankful For What You Have, and incorporating this important lesson into my presentations. MCA: That’s wonderful, Miranda! We always love hearing from you and are so glad you’re part of the Mom’s Choice family. Keep up the great work. What’s next for you, Weaver, and the PAWS and THINK!® crew? Miranda: Every day brings new possibilities for PAWS and THINK!® In addition to booking more school visits, signings and other events, I am always making new connections and finding ways to grow. I’m often asked “When is your next book coming out?” Although I do not have a definitive answer at the moment, I can say with confidence that my third book will certainly not be my last! I am always brainstorming new ideas for PAWS and THINK!® and I’m looking forward to seeing where this journey leads me! Thanks to Miranda Mittleman for spending some time with us, it’s always a pleasure. You can check out Miranda’s PAWS and THINK!® books on her website! 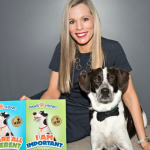 Tags:award-winners, inspiration, interviews, manners, Miranda Mittleman, parenting, PAWS and Think!